At the end of every month I like to look back and reflect on everything we talked about and give new readers a chance to see what this month was all about. By the way, if you are a new reader welcome! I look forward to connecting with you. November was a great month because we celebrated Thanksgiving here in the US and I believe that when we picture our lives we really do have so much to be thankful for. Early in the month I ran a post on culture shock and my first experience overseas way back in 2001. I remember driving from Jakarta to Bandung and seeing the discrepancy between the very poor and the shiny high rise buildings of Jakarta. As we drove through small villages the level of poverty was plain to see but so was the pride of the people. It’s one thing to see this on TV and completely different to experience it in person. I ran a fun post on 5 Travel Blogs You Should Be Reading. These are 5 of my favorite travel blogs. Readers also left some great comments with some of their favorite blogs so check out the comments section for more great reading material. Next up was a funny post on bathroom etiquette overseas. Ever use a squat toilet before? How about take a shower with a bucket of cold water? You can read all about it in this post. In the news this month was the story about John Tyner who refused airport security screening, not wanting to go through the airport scanner or as he put it “get his junk touched.” I wrote about airport security and asked a few questions of world travelers and their opinions on airport security around the world. Make sure you check out the great comments. I’m learning to speak the Indonesian language. There are many reasons to learn a second language but I highlighted 5 of what I feel are the most important reasons. I still have a ways to go before I am fluent but I am confident that one day soon I will be able to order food in an Indonesian restaurant without simply pointing at a picture in the menu and hoping for the best. We are all living very busy schedules and as the holidays approach we have a lot of things demanding our time. To help us deal with all these demands I put together a post on 10 Easy Time Management Techniques that have helped me calm the time beast. Hopefully it will help you as well. One of the things that I have enjoyed the most about starting this blog and beginning the sabbatical process is the people I have met and the relationships that have been built. The poem by Donna Maris that I put into this post on Building Social Capital to me really highlights and exposes the things we should really be striving for. Building social capital is all about creating and maintaining relationships with everyone whose path you cross. Yes it takes effort but that effort pays off in so many ways. Check it out and let me know your thoughts. I’ve had the honor to meet so many great people who are doing incredible things. My goal is always to be as much of a blessing to them as they have been to me. Are you new here? I’d love to hear from you and check out all the great things you are doing. Finally I want to bring to your attention a promotion that seems too good to be true. I first read about it over at my friend Sean Ogle’s blog Location 180. 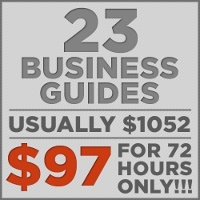 It’s the 72 Hour Business Book Deal, a collection of 23 of the best business guides on the Internet. There are some fantastic guides here that I have been considering purchasing myself and to be able to grab them all for $97 seems like a fantastic deal. One of the guides is The Unconventional Guide to Working for Yourself from Chris Guillebeau which I have purchased and really love and recommend if you have the desire to start your own business. Some of the others included in this collection that I have been interested in reading but had not purchased include Affiliate Marketing for Beginners by Corbett Barr, Location Independent Lifestyle Guide by Lea Woodward and How to Live Anywhere by Karol Gadja. If you were to buy all 23 of these products independently you’d spend $1052. I want to be completely transparent here. The above link to the sale site is an affiliate link and if you do purchase via that link I will make a few dollars which I would greatly thank you for and will go toward financing this 1 year sabbatical. I had already been eying many of the titles so for me it wasn’t a stretch to take advantage of this deal. I hope to review many of these guides in the near future and report on how I liked them. If you are interested go check out the sales page and read about all the guides that are included. The sale will end this Thursday December 2nd at 7AM PST. Oh yeah, $5 from every sale goes to Charity:Water a fantastic organization I personally support. What does December hold? With the holidays we plan on spending lots of time with family. This may be our last Christmas and New Year in the US for who knows how long (at least a year) so we want to spend quality time with family and friends. One of the most difficult aspects of taking off for a year is knowing that you will be away from friends and family for an extended period of time. So we are going to soak up this month like crazy. What are your plans for the holidays? Will you be traveling or staying close to home? I’m going through some of the material right now. I will say that there is a boatload of value in this deal, definitely worth the price of admission. Hey Nick! I spent the day going through it as well and am so glad I took the plunge. It’s an incredible value. As you said it is definitely worth the price of admission and then some. Plus as a bonus every sale nets $5 for Charity:Water which is a great organization. This is so great that you are doing this. Traveling with our family is our passion- our calling. We love to find others who want to do it too. How many children do you have? What ages? Good luck with everything, it will be fun to see your adventure. Hi Rachel! We have two kids ages 7 and 4. My wife is Indonesian so that is where we are headed. Love love love the video on your site!! Looking forward to connecting with you more and learning about your own adventures. I’ll definitely be checking out your site. Thanks for stopping by!